In April '11 I went to New Orleans for a Creative Love Mission and I invited 4 other artists to come along with me. While we were there, our hostess, someone that is part of my spiritual family, took us to "the tree" in a park by the Mississippi. It was a place that meant a lot to her. This particular week, the Mississippi was the highest it had been for almost a decade, peaking the day we left. Once we were there, we all hung out under the shade of the tree. Our host laid down, others walked around, I was busy with my camera. This shot I got of the tree was so beautiful to me, I decided to paint it. I went away with my family for my birthday in May '11. My mom and dad have a place on the inter-coastal waterway of NC that my mom affectionately calls "the river" and decided to bring my art stuff along. I set up my easel and paints, so during the weekend, I could stop throughout the day and paint a little as time allowed. I had so much fun with my family, it was a very special time. We have been through so much together and over time, have all come to know the Lord. There was such a peace the whole weekend as we spent time sharing about the goodness of God in our lives! One day, during the weekend, as we were all fishing, we saw a rainbow. There was no rain, it was nestled between two clouds. It went away and came back, this time coming out from the middle of a cloud. Again it disappeared and reappeared, this time reaching from under the cloud to the ground. It reminded me of what the Lord had promised when He gave us the rainbow...He would not ever flood the earth again. My family stood on the fishing pier singing happy birthday to me, as I took photos of it with my camera. 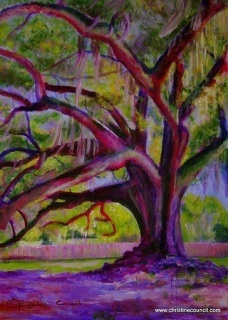 While I was finishing up the painting, the title came to me, "Family Tree". I realized, just like my family in the natural and spirit, this tree was like a family's love, strong, bold, colorful, a shady resting place...and, although it had weathered many storms, it was deeply rooted and planted by the River. Hurricane Irene came through and took out my parents special place. They lost everything, just like the people in New Orleans, where this painting began. It was a long hard day for my parents when we went to check on the camp after the storm. But the Lord met us in our pain, and I was honored to be the one God told to go and be with my parents as they wept over their loss. We stood together as a family and faced the storm together, we were stronger together. My dad was a big fan of Scotty McCreery, and his song came on as we got in the car to head back home. We all just looked at each other and started laughing, only God could orchestrate such a perfect song for the end of a long sad day of saying goodbye to memories and things we all loved. it's not to be found in the marketplace.